I shipped off what I thought was the last of the yarn tasting stuff on Monday, Berroco sent a skein of yarn for every participant plus two bags of Inca Tweed and books for door prizes. Then, I heard from Madelinetosh that they want to participate. That yarn arrives today and I will carry it to the conference. I have not had a single lesson to review since my last post. This has never happened before. Don't worry, I've used the time wisely. I guess my students are all on vacation! One thing I have noticed when I review Lesson 1 of the Basics class is that many students over block ribbing. In most knitted garments, the ribbing has a functional purpose, to snug up the garment at the waist/hips, wrists and neckline. If you stretch it out when blocking, the ribbing is no longer function. It becomes decorative. 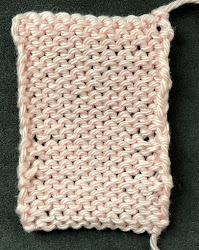 The photograph below shows two swatches which have exactly the same number of stitches and rows. The only difference is how they were blocked. Picture this at the bottom of a sweater. It may be the look you were going for but if it isn't, you probably won't be happy with the sweater. I've used ribbing both ways in projects. I do like the embossed appearance of over blocked ribbing. One place where ribbing can either make or break a sweater is at the neckline. It is very important that you pick up the correct number of stitches. Nothing looks tackier than a neck band that falls forward and flares or one that is stretched out. I'll be discussing these topics in my next entry. Notice in the photograph below how the swatches are pinned. Use your fingertips to flatten the selvedge stitches. Finishing will be much easier if you do this. While I was waiting for the yarn for my Cast On garments, I finished one of the many birthday presents I need to do. This is a scarf with the wave pattern. The yarn is Gleem Lace from Fyberspates. It is wonderful to work with as I am doing a second one in the same yarn but in green. Dot not be fooled by this photograph. I tried photographing this in several places but they all turned out the same. The color is actually a gold color, not camel. This will be a man's sweater with a shawl collar. The Fashion Framework is about collars and this will be the sweater that accompanies the article. I've redone it once. I didn't like the stitch pattern I chose.